BeejiveIM is now available for the iPad! Get it now for a limited time special introductory price! 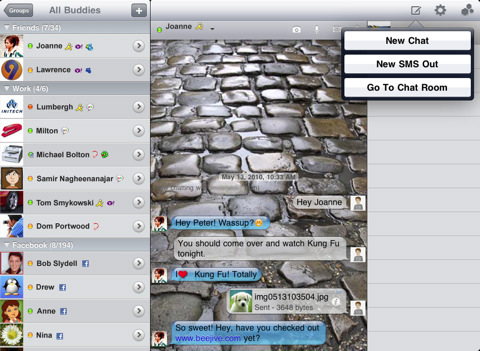 BeejiveIM for iPhone was widely recognized as the top mobile instant messenger for the iPhone/iPad Touch – selected as one of the best apps in iTunes Rewind 2009. See what reviewers are saying about BeejiveIM. Now, the intuitive interface and reliable service of BeejiveIM is available on your iPad, in an application customized for the iPad form factor! Stay connected to all your instant messaging buddies on your iPad through a single intuitive app! BeejiveIM (pronounced \bē-hīv\ IM) keeps you in touch with your friends on AIM®/MobileMe®, MSN®/Windows Live®, Yahoo!®, GoogleTalk®, Facebook, MySpace, ICQ® and Jabber… all at the same time, all on your iPad. Beejive’s reliable and efficient networking has been tested and proven on multiple platforms. Now it is available for the iPad. Move from 3G (if available) and wifi connections seamlessly. Stay connected after you close the application and be notified when you get a new message through push notifications. After being out of coverage BeejiveIM automatically reconnects and picks up where you left off. BeejiveIM uses your iPad’s data plan (if available) or wifi connection, so there are no per message charges. – Reliable and efficient networking: be connected 24/7, and it’s gentle on your battery. – Be connected even after you close the application. Get notified instantly when you get a new message with Push Notifications. – Works with multiple IM networks, multiple accounts per network: AIM®/iChat, MSN®, Yahoo!®, GoogleTalk®, Facebook IM, ICQ®, Jabber, and MySpace IM. – Send and receive files, including pictures and voice notes. View and forward received documents. 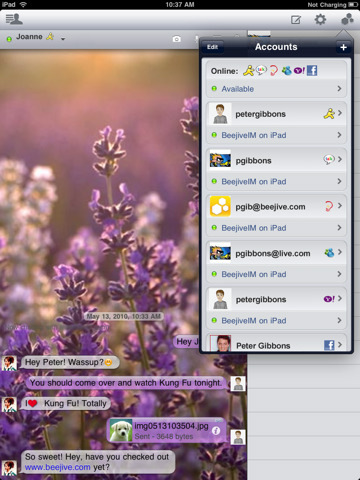 – Desktop-like instant messaging with all of your IM buddies from a single intuitive user interface. – Real-time chats: quick switch between multiple simultaneous chats. – Group chats: chat with multiple buddies on AIM, Yahoo, GTalk, or MSN. – Full Unicode support, chat in any language supported by your iPhone. – Chat in any orientation. Compatible with external keyboards. – Chat history: Email chat logs to save chat history. – Hyperlink support, automatically parses links for web pages, YouTube videos, email addresses, and phone numbers. – SMS out, chat with your SMS buddies through AIM or Yahoo SMS out. SMS out is fully integrated with your iPad address book. – Manage your buddy-list, including add/remove, nicknames, groups, block, approve/deny requests. – Merge multiple IM buddies for the same contact under a single buddy list entry with meta contacts. – Sort/group/search your buddy list. – Control your own availability, set auto-away and custom status messages, be invisible, change privacy controls. – Configurable alerts, customizable sound settings. – Buddy icon support, view your friends’ icons, set your own. Article suivantapplication Let’s Golf !